France’s Kylian Mbappé was named the best young player of the World Cup. 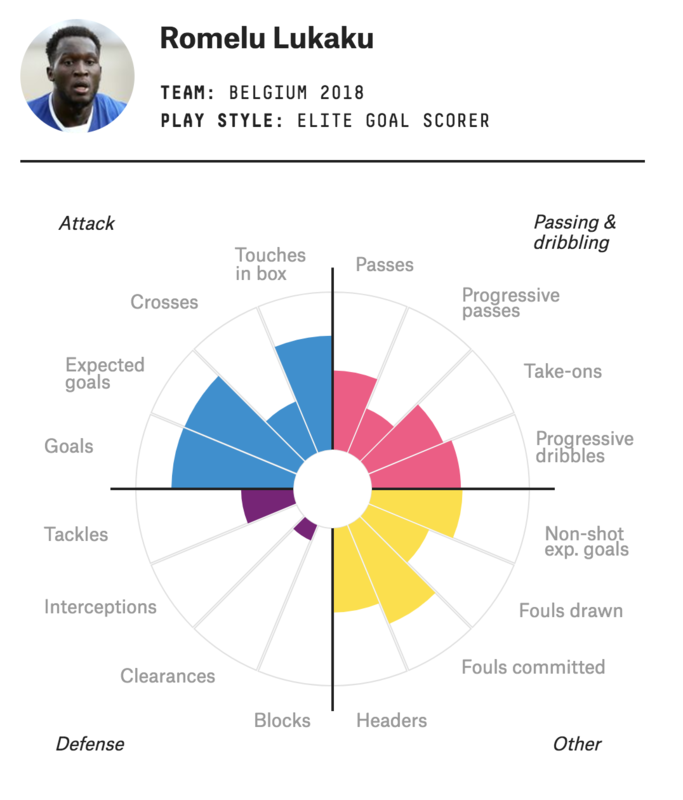 Breakout performances seemed to be everywhere at the 2018 World Cup — young talents were launched to international fame, and established players had their names crystallized on the world stage. 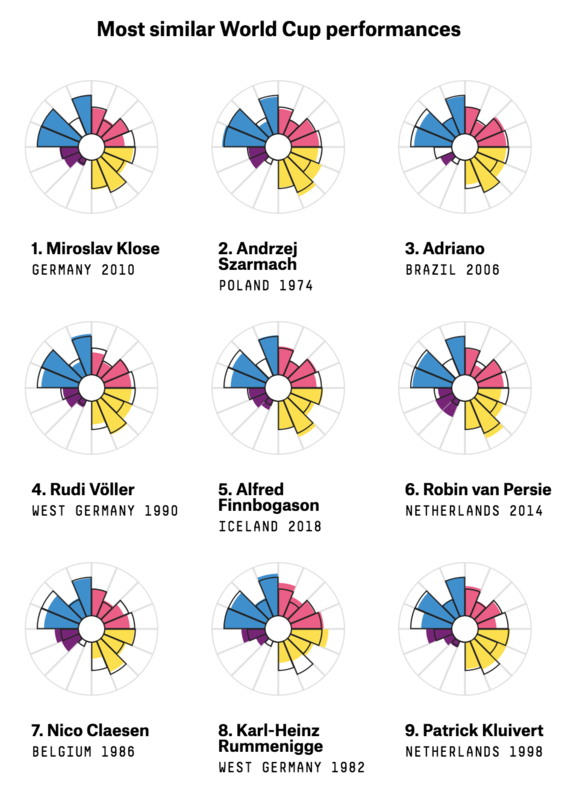 The world’s biggest soccer tournament gives players a chance to shine outside the club-level paradigm of consistency and — apart from the English Premier League — a largely domestic audience. On the back of a few impressive performances, players like CSKA Moscow’s Aleksandr Golovin, one of the key players in Russia’s run to the quarterfinals, can earn themselves the chance to move to one of Europe’s top clubs, even if this recruitment trend is less common than it once was. 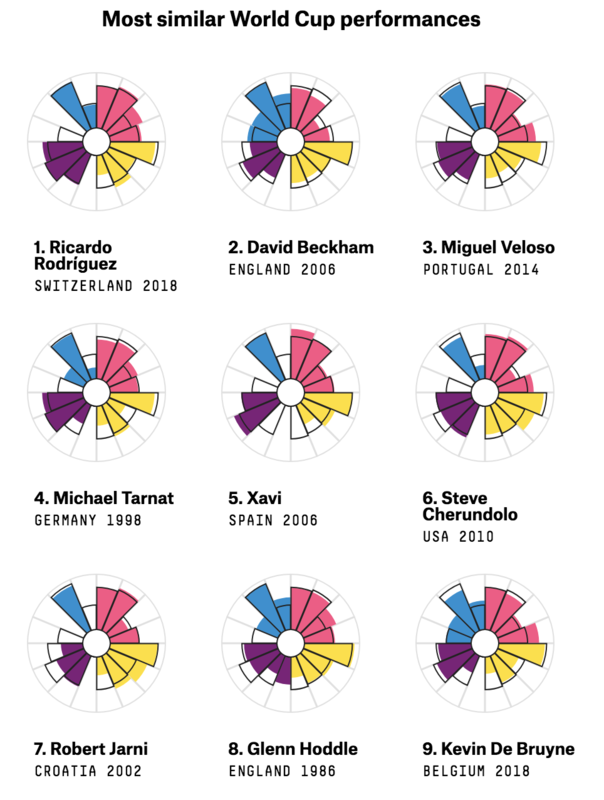 Kylian Mbappé’s talent has been known by soccer’s inner sanctum for the best part of a decade: Europe’s biggest clubs have been circling like sharks since he was just 10 years old. 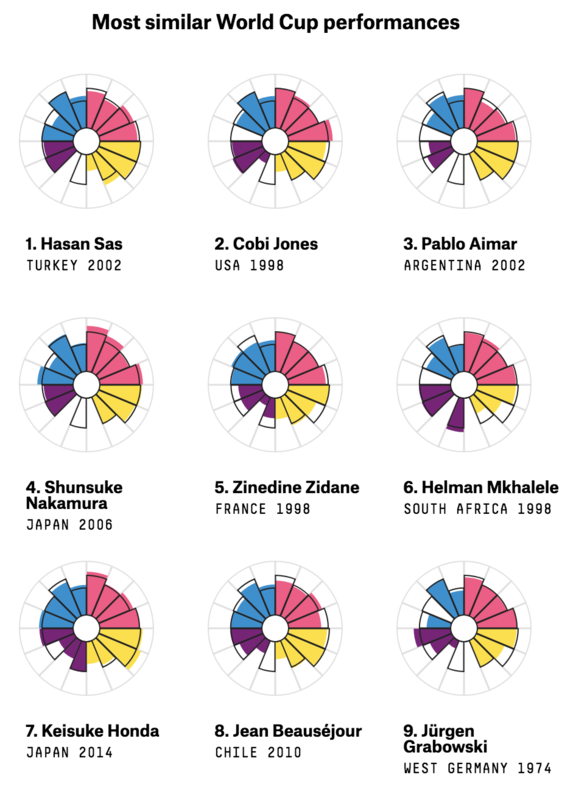 While his performance in this tournament, culminating in being crowned the tournament’s best young player, may come as no surprise to those who knew of him, this summer’s World Cup has turned the French speedster into a global phenomenon. 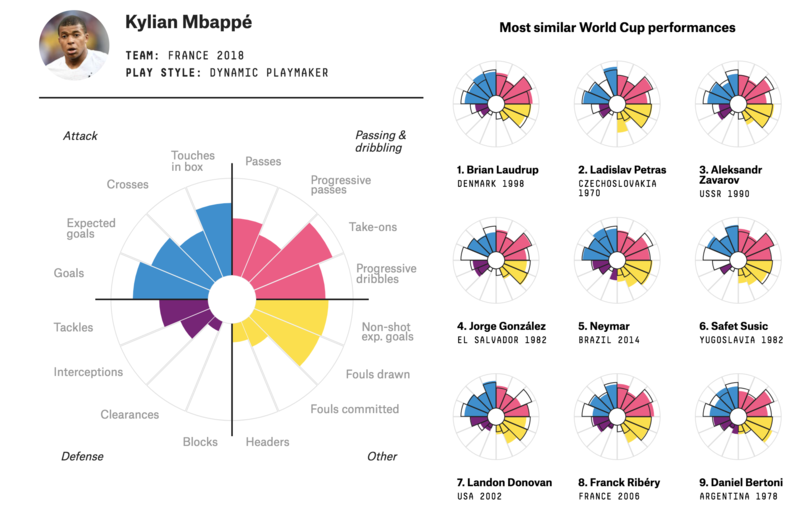 Mbappé’s electric ability to create space and dribble progressively defines his output from the tournament, making his closest historical analogue the 1998 World Cup performance by Denmark’s Brian Laudrup, who was a similarly dazzling dribbler. 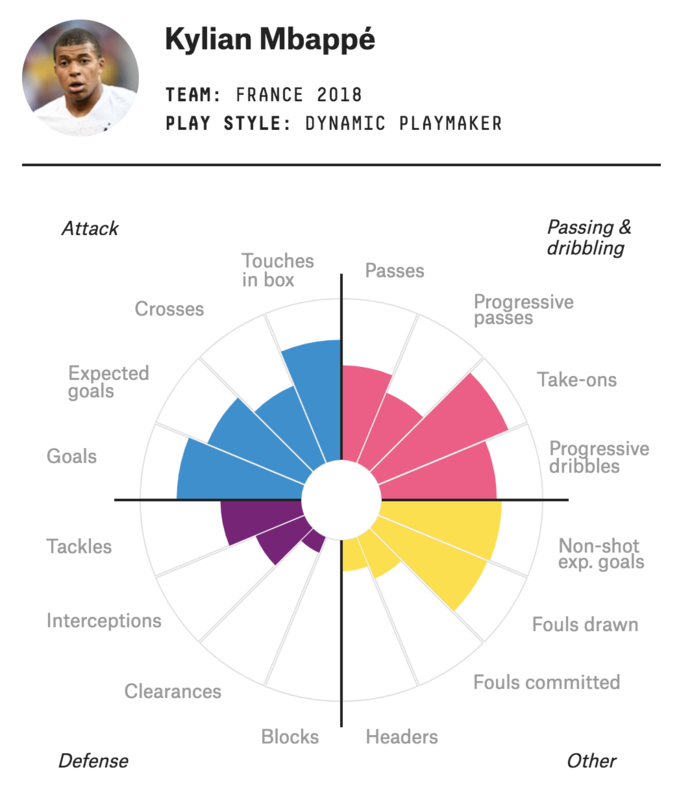 In Russia, Mbappe thrived on the counterattack for France while playing at right wing, but he may yet transition to a role in the center of the field. If that happens, the predictions of many that he is heir apparent to Thierry Henry may well bear fruit. While it may seem odd to class a striker whom Manchester United purchased for nearly $100 million as a “breakout star,” Romelu Lukaku has had his fair share of doubters. 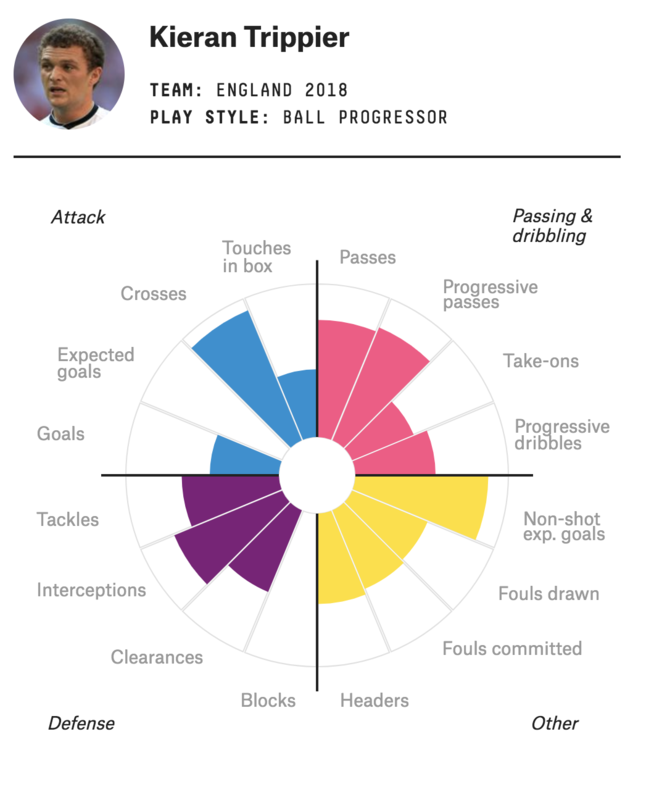 No doubt, his performance in Russia has silenced the majority of them: The towering striker’s intelligent movement and incisive hold-up play complemented a 4-goal haul. 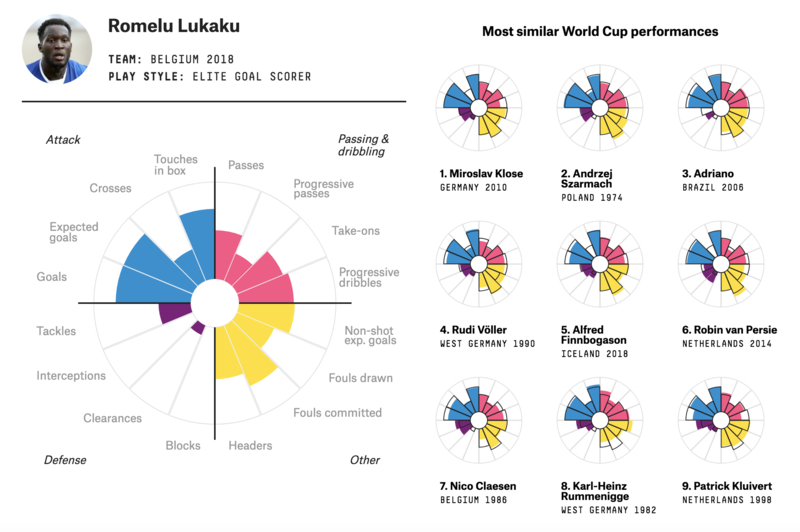 The 2010 performance of Miroslav Klose, who is the top World Cup goal-scorer of all time, is the most similar historically to Lukaku’s 2018 outing, while the 2006 showing by the explosive Brazilian Adriano is third-closest. England finally met pre-tournament dark horse expectations by making it to the semifinal this year. And even though Harry Kane took home the golden boot, the Englishman who really made a name for himself was a right back: Kieran Trippier. 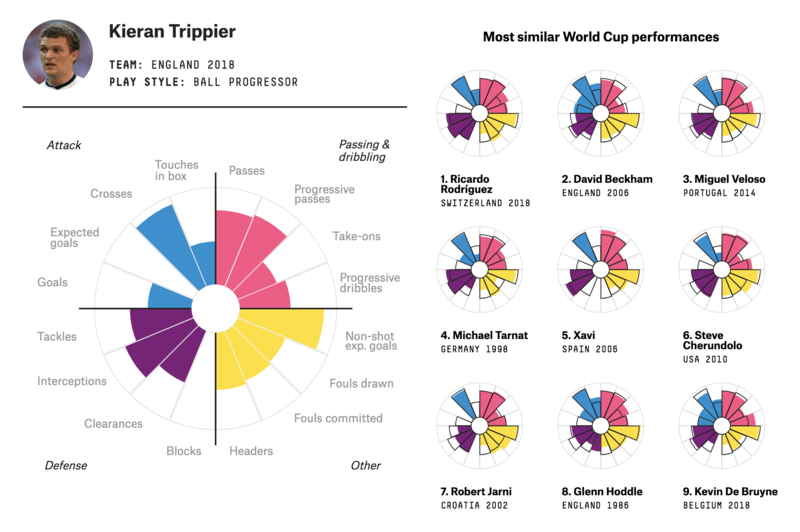 Trippier’s willingness to cross the ball is a throwback to a quintessentially English style, and that combined with his devastating set-piece delivery added up to a performance that was very similar to David Beckham’s in the 2006 World Cup. And that’s about as complimentary a comparison as Trippier could hope for. There are few better ways to announce yourself at the World Cup than how Hirving “Chucky” Lozano went about it. 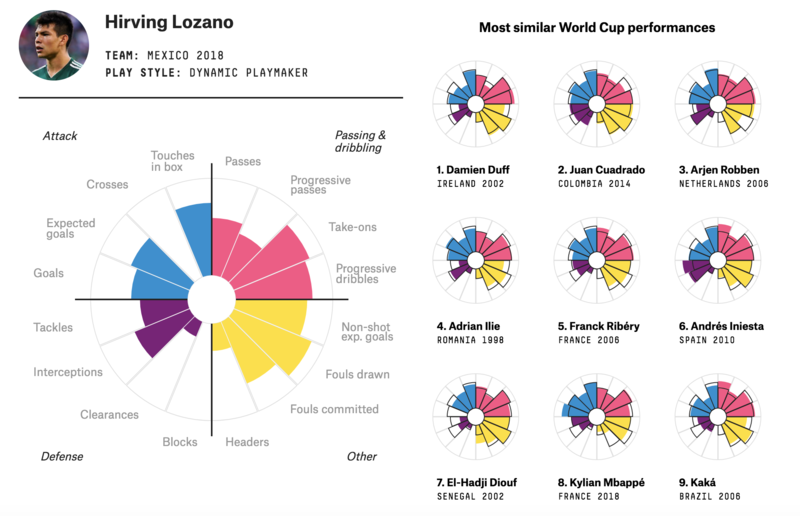 In Mexico’s first match of the tournament, Lozano scored the winner against the defending World Cup champions, Germany. 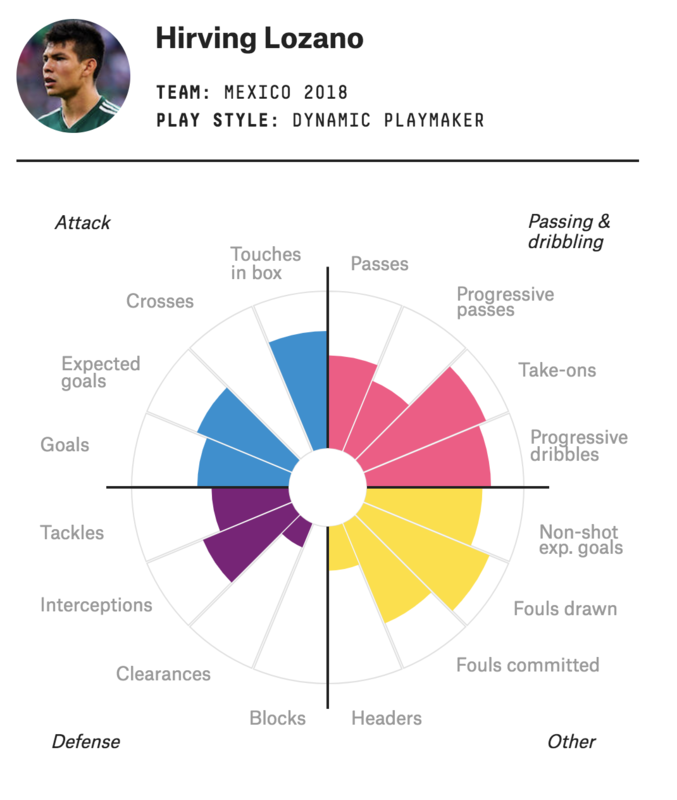 Playing on the left with an ability to roam, the diminutive attacker was El Tri’s main ball progressor on the counterattack. 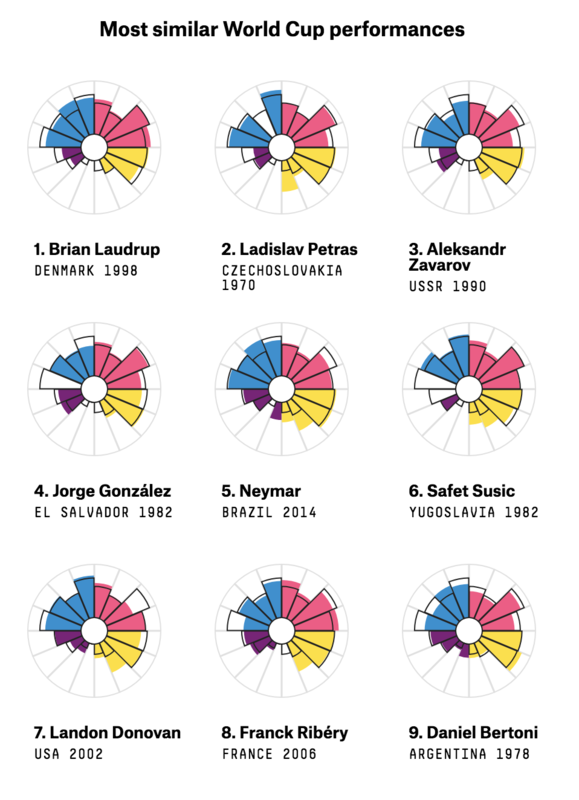 The 2014 performance by Juan Cuadrado, who fulfilled a similar role for Colombia, providing a fast outlet for Los Cafeteros on the break, is the second-most-similar performance to Lozano’s in 2018. 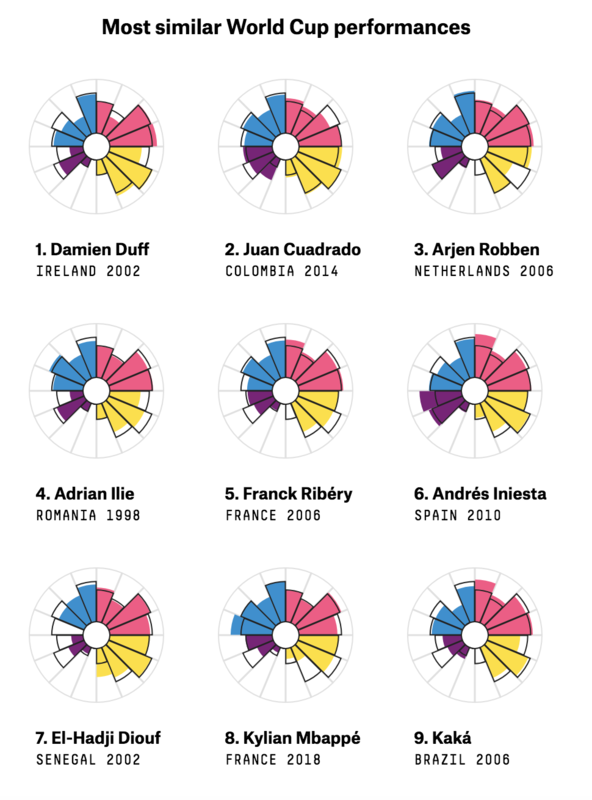 The 2006 showing of Arjen Robben, the Netherlands’ left-footed dribbler, is the third-most-similar. No player epitomizes the World Cup’s ability to rejuvenate a player’s brand as much as Switzerland’s pocket-sized tank, Xherdan Shaqiri. 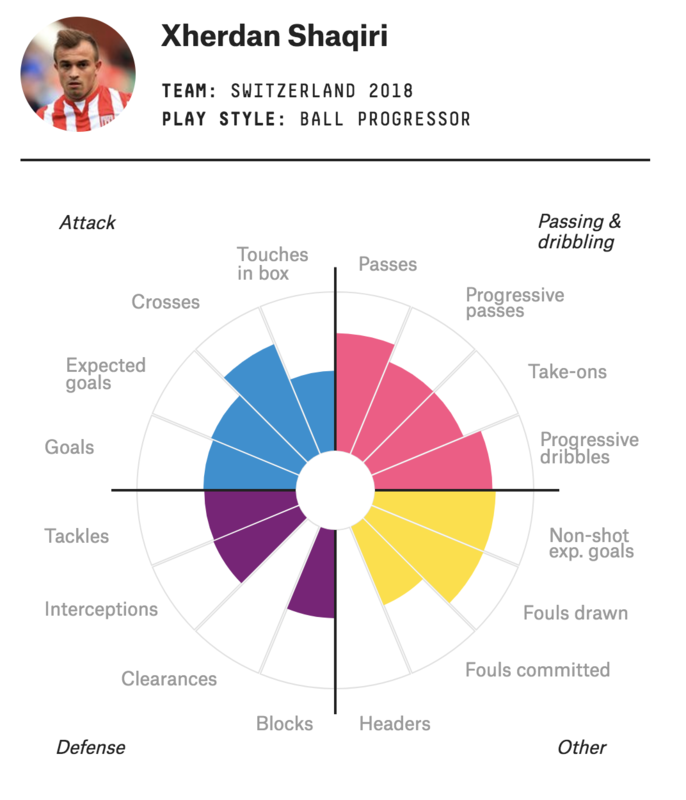 After Shaqiri’s lackadaisical season for Stoke City, which was relegated from the Premier League, it looked as though his career trajectory — from Bayern Munich and Inter Milan to the second rung of English soccer — would continue to be downward. But that course may have been reversed in Russia as Shaqiri led Switzerland to the knockout round — notching a goal, an assist and a team-high 10 chances. 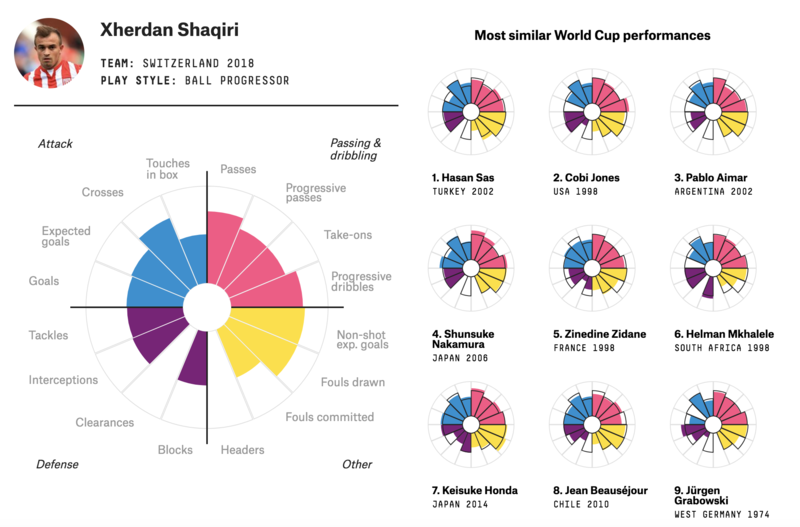 It may well be the case that Liverpool intended to purchase Shaqiri regardless of his showing in Russia, but the team’s acquisition of the Swiss winger will definitely go down better with supporters after a series of performances in Russia that FiveThirtyEight’s model found were similar to those of Argentina’s Pablo Aimar in 2002 and the iconic Zinedine Zidane of France in 1998.